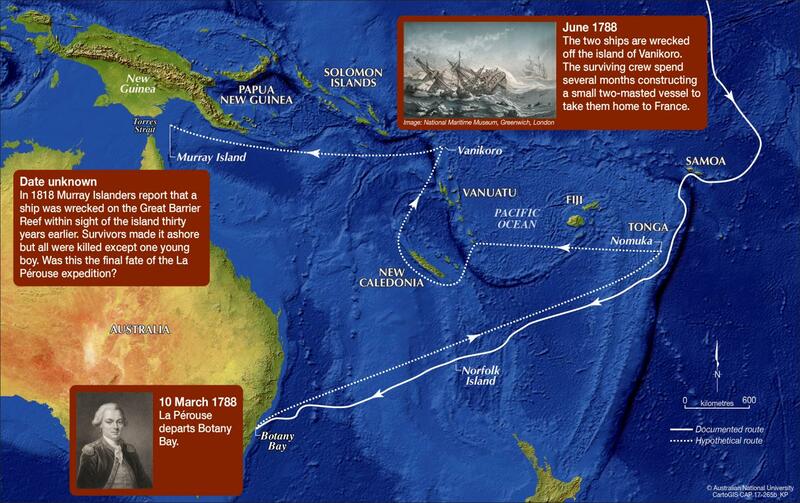 An anthropologist at The Australian National University (ANU) may have stumbled across a clue to resolving one of the most enduring mysteries of Pacific history – the fate of famous French navigator, Jean François de Galaup, Comte de La Pérouse who disappeared in 1788. La Pérouse was instructed by King Louis XVI to undertake a major voyage of exploration in the Pacific to emulate the feats of Captain James Cook. He departed the French port of Brest in 1785 with two frigates and a complement of 225 officers, sailors and scientists. Dr Garrick Hitchcock, of the ANU School of Culture, History and Language, believes the last survivors of La Pérouse's voyage were shipwrecked on the Great Barrier Reef near Murray Island, in northeast Torres Strait. "La Pérouse's voyage of discovery in the Pacific is recognised as one of the most important of its era, rivalled only by the work of Cook. He remains a very well-known and respected figure in eighteenth century scientific exploration," Dr Hitchcock said. What is known is that La Pérouse's ships Astrolabe and Boussole were wrecked in 1788 on Vanikoro, a small island in the Santa Cruz Group of the Solomon Islands. The survivors made it to shore and spent several months constructing a small two-masted craft, using timber salvaged from the wreck of the Astrolabe. Once completed, they launched the vessel in a bid to return to France. "What became of this ship and its crew, desperate to return to France, has been an ongoing mystery." While researching a project on the history of Torres Strait, Dr Hitchcock came across an article published in an 1818 Indian newspaper, The Madras Courier. He is confident the article reveals what became of the survivors. The article tells the story of Shaik Jumaul, a castaway Indian seaman who survived the sinking of the merchant ship Morning Star which was wrecked off the coast of north Queensland in 1814. Jumaul made it to Murray Island, where he lived for four years, learning the language and culture of the Islanders. He was finally rescued by two merchant ships that passed through the area in 1818. "Jumaul informed his rescuers that he had seen cutlasses and muskets on the islands which he recognised as not being of English make, as well as a compass and a gold watch," he said. "When he asked the Islanders where they obtained these things, they related how approximately thirty years earlier, a ship had been wrecked on the Great Barrier Reef to the east, in sight of the island. "Boats with crew had come ashore, but in the fighting that followed, all were eventually killed, except a boy, who was saved and brought up as one of their own, later marrying a local woman." The La Pérouse expedition crew list includes a ship's boy (mousse), François Mordelle, from the port town of Tréguier in Brittany, northwestern France. Dr Hitchcock wonders if Mordelle could be the last survivor of the La Pérouse expedition. "The Indian newspaper article featuring the castaway's account was later reproduced in several other newspapers and periodicals of the day, in Australia, Britain, France and other countries, and observers noted that this might refer to the La Pérouse expedition," Dr Hitchcock said. "Somehow, Shaik Jamaul's story was subsequently largely forgotten." While a French book published in 2012 refers briefly to this newspaper article and discounts it as unreliable account, Dr Hitchcock believes otherwise. "The chronology is spot on, for it was thirty years earlier, in late 1788 or early 1789, that the La Pérouse survivors left Vanikoro in their small vessel," he said. "Furthermore, historians and maritime archaeologists are not aware of any other European ship being in that region at that time. This means that this is the earliest known shipwreck in Torres Strait, and indeed, eastern Australia" he said. "It could well be that the final phase of the La Pérouse expedition ended in tragedy in northern Australia. Future recovery of artefacts from the wreck site on the Great Barrier Reef – yet to be discovered – or the islands, will hopefully provide final confirmation." The Torres Strait region, which includes the northern part of Australia's Great Barrier Reef, is studded with reefs, rocks and sandbars, and has been described as a 'graveyard of ships'. Over 120 vessels are known to have come to grief in its treacherous waters. An article by Dr Hitchcock, detailing Shaik Jumaul's account, has been published in the Journal of Pacific History.